Medical office cleaning and general office cleaning are very different. Medical offices aren’t just dusty and full of crumbs and coffee rings on desks — they are contaminated with contagious germs which, if not properly eradicated, can spread to other patients and staff, causing sickness, lost work days and worse. Do not trust the cleaning of your medical office to just any commercial cleaning companies — confirm that the one you hire has experience and certification in medical facility cleaning. BearCom properly cleans medical offices using proper care and equipment. For a free quote, fill out the form to the right. Proper handling of waste in a medical office setting is crucial. Most doctor’s offices and medical facilities have special containers for disposal of sharps such as used needles so that the contaminated material can go in but is not able to spill out. Regardless, certain safety procedures must be followed with trash disposal, and that includes cleaners not packing or pushing down the trash with their hands. This prevents not only an accidental needle stick from an improperly disposed of sharp object, but also avoids the spread of contamination that can happen when hands go between trash and furniture surfaces. Wearing gloves at all times and disposing of trash without coming into contact with it helps prevent the spread of disease. Using the right cleaning products is also a critical aspect of our medical office cleaning services. Specific chemicals must be used to ensure a germ-free environment. 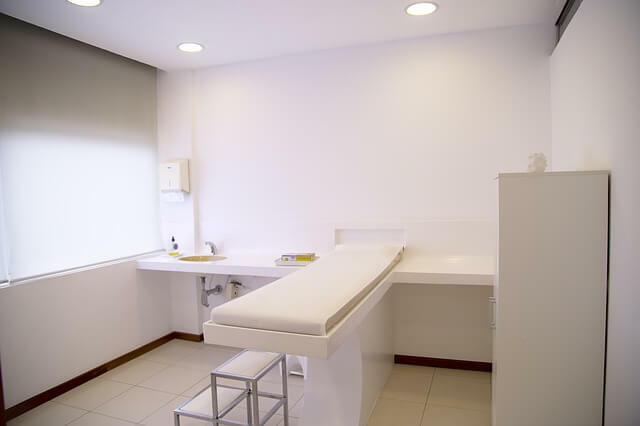 You can wipe down your kitchen counters with Formula 409 or clean your bathroom with Soft Scrub and get a satisfactory result, but the workstations and exam rooms in medical facilities have to be properly disinfected. Personnel who clean medical offices should undergo special training in infection control, safety and security, and quality assurance. When seeking a cleaning company for your medical office, ask if their employees undergo any specific training, and ask to see any certifications they or the company might have that can attest to their level of expertise. Ask them if they have any accreditations from national agencies such as the Centers for Disease Control and Prevention or the Occupational Safety and Health Administration. In addition, cleaning personnel in a medical office setting should use special protective equipment including gloves, masks and gowns when necessary. They must be properly educated in how to follow disinfectant protocols so that each day your facility opens its doors, you are starting out with a clean slate and no risk of cross-contamination is present. BearCom provides thorough, safe cleaning of medical offices in and around Salt Lake City, Utah. Their employees undergo extensive training in how to safely and completely disinfect surfaces, keeping your environment protected and free of pathogens. Call them today if you need reliable, thorough medical facility cleaning services for your Utah medical office.